Members of the club recently spent an enjoyable afternoon on the East Branch of Fish Creek helping Bill Legge and Norm Webber of Project Watershed do a stream survey. Project Watershed is a consortium of individuals, schools, university professionals and nature educators. 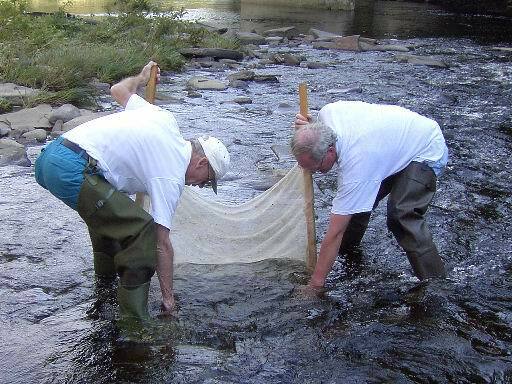 It was founded in 1994 and it adopted and enhanched the Izaak Walton League's "Save Our Streams" program. Data collected by Project Watershed particpants is uploaded to a website that is maintained by Syracuse University's Living School Book project (http://projectwatershed.org). on, under and around the rocks on the stream bed. A three foot by three foot area is scoured to free the living insects which are swept up by the current and are caught by the net. 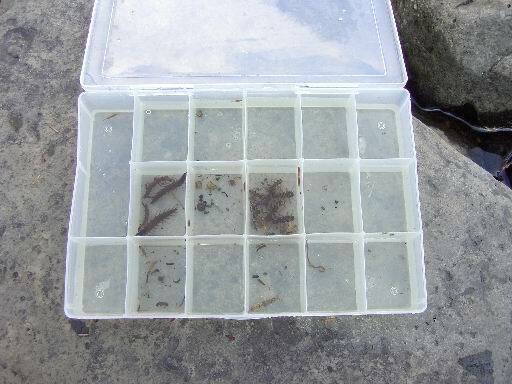 Several stonefly nymphs were recovered. This is an example of one of the smaller stonefly nymphs. 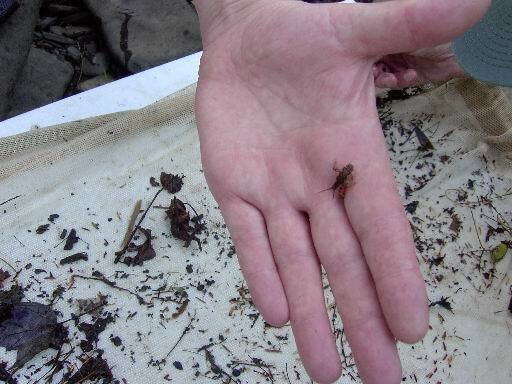 The life of a stonefly begins with hatching from an egg in the water. It then spends much of its life as a nymph. When it matures it crawls up on stones or other structures, sheds its exoskeleton for the last time and flies off as a winged insect. It then mates and the females lays eggs back into the water to begin a new cycle. Stoneflies nymphs are classified as sensitive to the environment and are found only in well oxygenated waters. This is some of the specimens collected on Septermber 4. Starting with the compartment with the largest creatures and going around in a clockwise fashion are hellgramite, water penny, stonefly, May fly, (empty) and caddis fly larva. To see a close up of these creatures, click on the compartment of interest.